Built by a wealthy peasant, this country house embodies the cultural and social themes that defined late 19th-century Russia. It is being renovated by a young Russian couple who are making it into a Bed and Breakfast, so you can stay there too! From St. Basil’s on Red Square to the pastel Baroque palaces of St. Petersburg, Russia has many distinctive architectural monuments. Yet none seems more unexpected than a wooden mansion built deep in the forests of Kostroma Region at the end of the 19th century. The mansion, or Terem, at Astashovo village seems all the more improbable for being rescued from the destruction that is common for Russia’s pre-revolutionary country houses. At the beginning of this century, the exuberant structure looked everything like a haunted tower house in a Hollywood film, hidden by young trees and teetering on the brink of collapse. Then fate intervened. 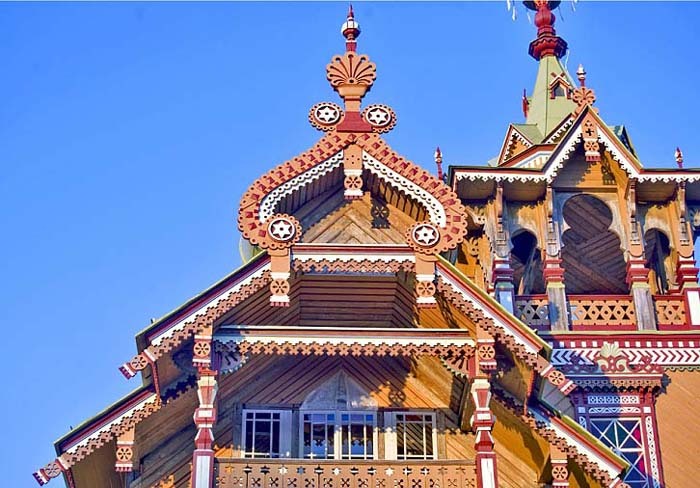 The builder and owner of this extraordinary wooden structure was Martyan Sozonovich Sazonov. Born in 1842 in the village of Astashovo (Ostashevo) near Chukhloma, Sazonov came from a solid family of state peasants. His biography questions a number of assumptions about the peasantry in 19th-century Russia. Although the majority of peasants had little land and less money, there were those exceptions who, thanks to a combination of hard work and good fortunate, amassed considerable wealth. In the areas around Kostroma and Yaroslavl, this wealth typically came from St. Petersburg, where enterprising young men would go to be seasonal construction laborers. When the time came for Martyan to submit documents allowing him to work in St. Petersburg, he decided to take the first name of his father (Sozon Markov) as his family name — Sozonov, pronounced and subsequently written as Sazonov. According to the regional practice, boys between the ages of 12 and 14 would be sent for a four-year apprenticeship in the capital’s building trades, after which they would be placed by specific skills. Sazonov gained the profitable designation of master carpenter and woodworker with a specialization in furniture making. Like most of his peers, Sazonov continued to maintain close ties with his native region. In 1862, he married a young woman, Anna Andreevna, from the neighboring village of Faleleevo. Having become a successful contractor with his own laborers and workshops in St. Petersburg, Sazonov brought some of his profits back to the Chukhloma region. 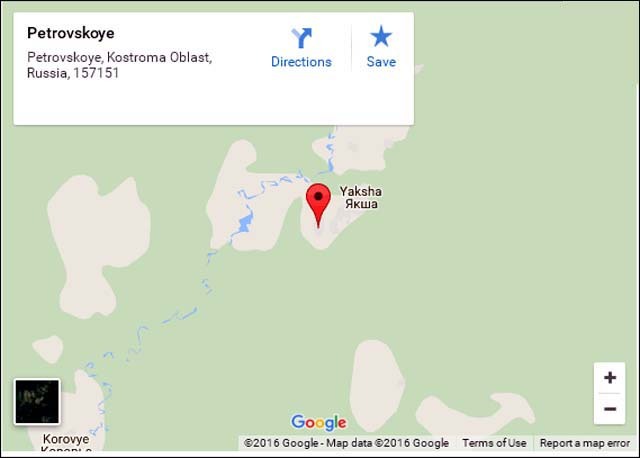 He not only built houses in Chukhloma itself, but also made charitable donations locally. However, it appears that after the 1860s, Sazonov’s successful business kept him in St. Petersburg for most of the year. In the mid-1890s, his first wife died from typhus, and he remarried, to Ekaterina Dobrovolskaya, the 21-year old daughter of a deacon at the Church of Elijah the Prophet in the neighboring village of Ilyinskoye. Shortly thereafter (presumably in 1897), he built the wooden mansion at Astashovo. The house that Sazonov built is often referred to as a “dacha,” a small country home for city dwellers, yet it is anything but modest. Its complex, sophisticated design consists of a two-story main structure of stout fir logs, above which is a third floor with projecting balconies and summer rooms. This upper structure reflects a 19th-century interpretation of traditional chambers known as a “terem,” or “teremok”—hence the name of the house. The complex roof, with its balconies and dormers, is a riotous display of ornamentation. The roof beam supporting the top is a single pine log reputed to originally have been 120 feet long. The culminating flourish occurs at the southwest corner with a soaring tower, crowned by a festive maypole ornament. 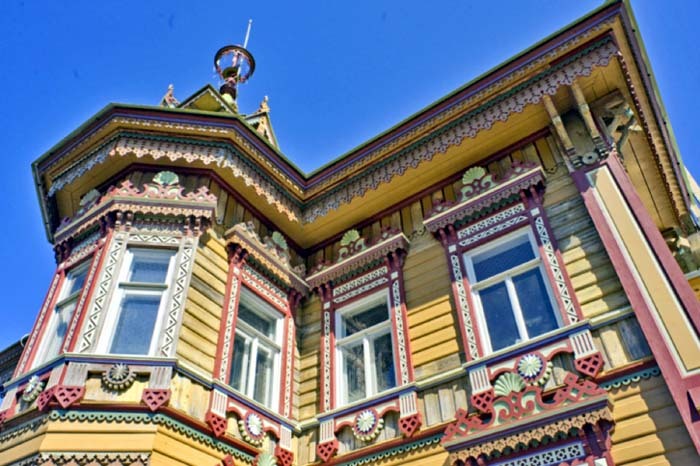 The plank siding over the log walls provides a background for ornamental cornices and decorative window surrounds (nalichniki) in bright colors. 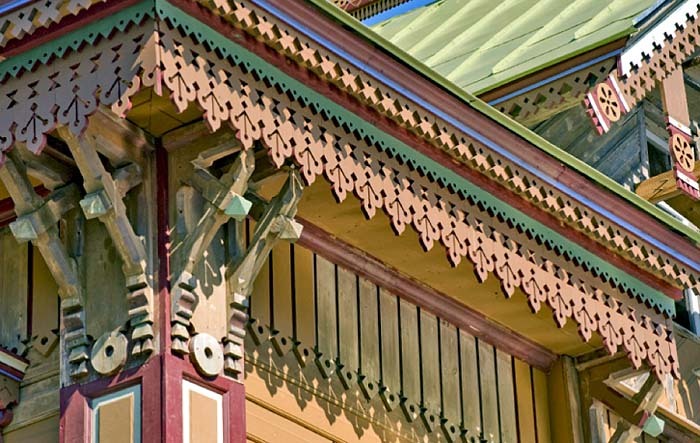 Although suggestive of traditional wooden structures such as the peasant house (izba), the window decorations here have a bold, abstracted design characteristic of a 19th-century national revival aesthetic. This stylized urban influence is evident here in ornamental details such as shell cartouches, as well as motifs from classical architecture. These elements enriched folk decorative patterns that were being transformed in the 19th century, as master carpenters working in large urban centers returned to their villages with a new repertoire of decorative motifs. The Sazonov terem is, therefore, an urbane work of art that owes much to traditional craftsmanship but no less to romantic aesthetic ideas about native architecture. Ivan Ropet (Petrov), so instrumental in the Abramtsevo group, was one of the main artistic proponents of this national revival, and his influence figured prominently in a popular publication of sketches and plans known as Motifs of Russian Architecture (Motivy russkoi arkhitektury). Such widely distributed publications, which contained profuse designs for wooden country houses, were no doubt known to Sazonov and the architects with whom he worked in St. Petersburg. In this context, the Sazonov house, located in remote Astashovo, has a direct connection with a major aesthetic movement in the Russian capital. Without maintenance, the superbly built structure receded into the forest growth that increased with every passing year. In the early 21st century, alarms were raised about the fate of the Terem, which in its dilapidated state seemed on the point of collapse. As often the case with such treasures, there appeared to be no viable plans for the rescue of a large and virtually inaccessible structure. However, the publicity brought the house to the attention of a young investment specialist, Andrei Pavlichenko, who turned the decaying landmark into a personal project. Knowledgeable in Russian culture and preservation, Pavlichenko enlisted the services of Alexander Popov, the most experienced specialist in the restoration of wooden monuments. Their first tasks included upgrading an access road and clearing the site around the house of recent forest growth. In 2011, a brigade of workers disassembled the remaining structure and transported it to the Popov workshops in the Vologda Region town of Kirillov, where the wooden components were analyzed. Restoration methods were applied to serviceable components and the rest (particularly the decorative details) were carefully replicated from the original. In 2013, work began on reassembling the Terem at its original site on a brick foundation that reproduced the original. This process also entailed the rebuilding of the annex, an essential wooden service structure that extended from the back of the mansion. As of 2016, the exterior work is now complete. Work on restoring and furnishing the interior has proved more complicated, since the shell of the house had been thoroughly depleted. Traces were reclaimed of original furnishings such as gargantuan ceramic stoves, but no furniture remained. What should have been a massive stairway from the first to the second floors was only a gaping void. Nonetheless, the original arrangement of the rooms is clear and will be restored by 2017. The restoration project also includes the ponds that lay in front of the mansion. (Water for the household came from a deep artesian well in this swampy area.) 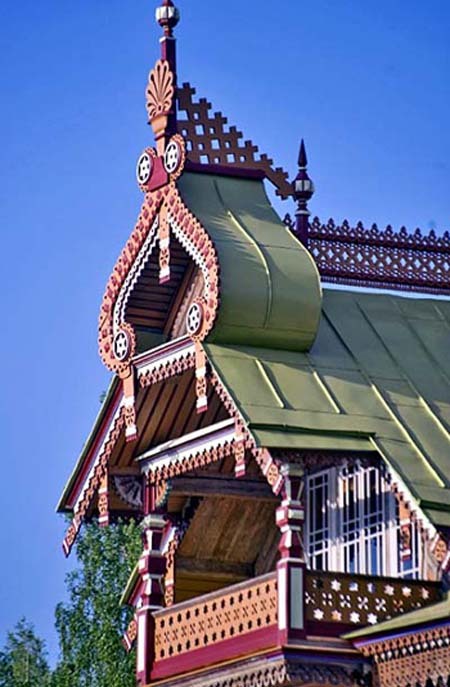 A final accent is provided by the restoration of a wooden chapel (from the nearby village of Golovinskoye) that was built at the same time as the Terem with some of the same decorative flourishes. 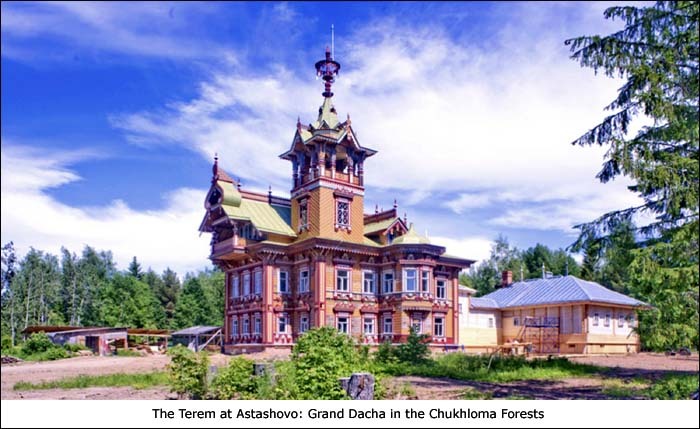 As a magnet for cultural tourism, the Terem at Astashovo is becoming a remarkable demonstration of enlightened architectural preservation. And just down the road at the village of Ilyinskoye, the Church of Elijah the Prophet (1815) still stands in abandoned, but lyrical beauty.